When the arteries carrying blood to the heart are chocked, a bypass is made by connecting new arteries to heart, through which the blood can easily pass. Sometimes, a Society, like a person, needs bypass surgery. Today, Sindhi Society is passing through a cultural crisis which can be overcome only through a cultural bypass surgery. We know that language, literature and culture are inter-related. The process of receiving cultural heritage is from language to literature and from literature to culture. 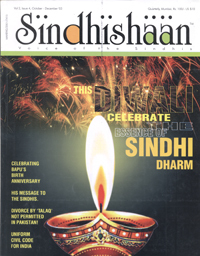 Due to some historical events, this normal way of cultural transformation is blocked for the Sindhi Community. Today, Sindhis are scattered throughout Indian and all parts of the World. Everywhere, Sindhis have adopted the local language. The new generation of Sindhis, due to lack of Sindhi language and literature, feel that Sindhis do not possess culture of their own. These youngsters are therefore not emotionally attached to their own roots. They feel shy to be recognized as Sindhis and suffer from inferiority complex. As the channel of access to culture through Sindhi language and literature is blocked, we need a bypass to reach the goal of cultural identity. This bypass will be from vocal culture to culture and from culture to language and literature. Our youngsters can be linked to Sindhi culture through Dance, Drama and Music initially and imbibed with the love for Sindhi language and literature later on. This way, we will be able to keep the Sindhi culture, the soul of Sindhi Community healthy and functioning.